The registration period for the first semester of 2019 is now officially closed! If you missed the registration period for some reason or another, that’s unfortunately too bad. 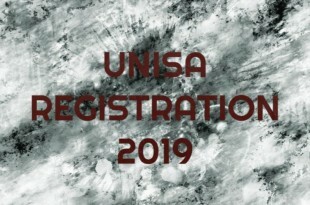 The next chance you will have to register to study at UNISA is in June 2019, when the second semester registration period opens. If you need to register to study with UNISA you can only register in the second half of 2019. If you were accepted to study in 2018 and you missed registration then unfortunately it’s a waiting game for you as registration only opens up in June. If you are a returning student remember that you need to register to at least get the required credits you need in order to keep going with your studies. If you do less than the minimum requirement, you will not be able to continue. In your first year of studies you need a minimum of 36 credits over two semesters. This will not apply to you if you are on an extended program or alternative pathway. For this you will need a minimum of 24 credits per year (or two consecutive semesters). In your second year of studies you need a minimum of 48 credits over two semesters. You can only register with UNISA if you had successfully applied at the institution and was accepted. The UNISA application process is a complicated process. You need to make sure that you submit all of your documents in the exact format that UNISA wants it to be. UNISA will not accept your application if you don’t. Then you’ll need to apply the following year again. You can only register if you have applied, and received confirmation of acceptance from UNISA. Please note that you will be removed from the registration process if UNISA finds that you were incorrectly accepted. If you ever feel like the weight of all your studies are weighing heavily on your shoulders, don’t forget that we are always here to help. We offer high value, low-cost support for UNISA students in BCom, BCompt and LLB degrees. If you are interested to see what we have to offer, go to our shop, look for the resources of your choice and kickstart your studies today!